Return trips give us another chance to fix things from previous visits. I’m thankful for that. Somehow, I managed to spend a whole summer in Tuscany while I was in college and I never made it out to Cinque Terre. I actually didn’t find out about its existence until after shortly after that summer, and I’d keep kicking myself for years after that. It was gorgeous, I don’t think I saw a single unattractive photo from Cinque Terre. It sounded so otherworldly- five ancient cities connected by highly regarded hiking trails. 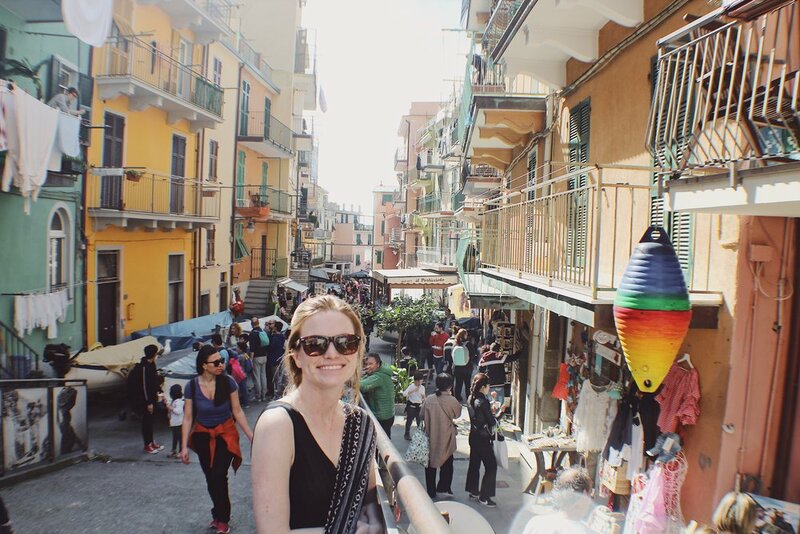 When I went back to Italy this spring, I knew that one must-see spot would be Cinque Terre. 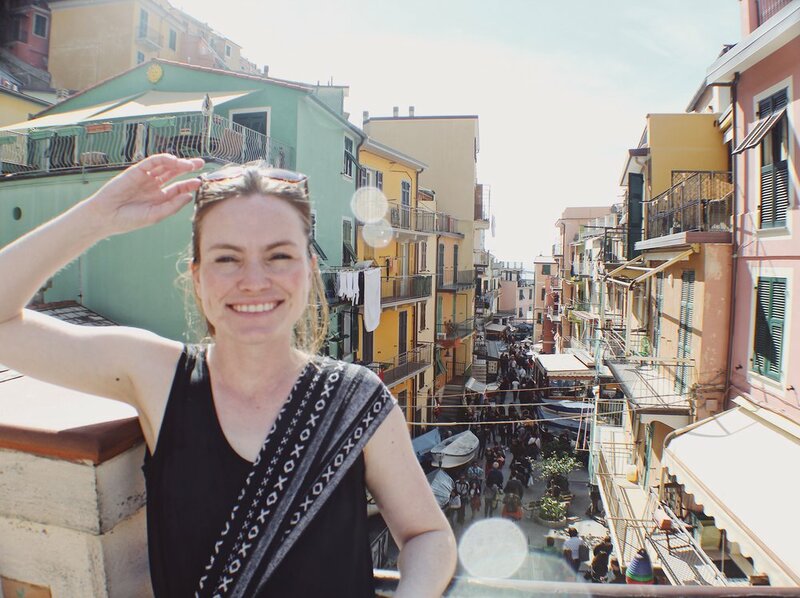 “This will be a spot you and I can discover together,” Deanna reminded me, and suddenly I felt very thankful that I left some of Italy to be discovered later, especially with her to take along. All the online research I did seemed to suggest that our best bet would be to stay in La Spezia, a larger city that serves as a gateway into Cinque Terre, which is an actual national park. 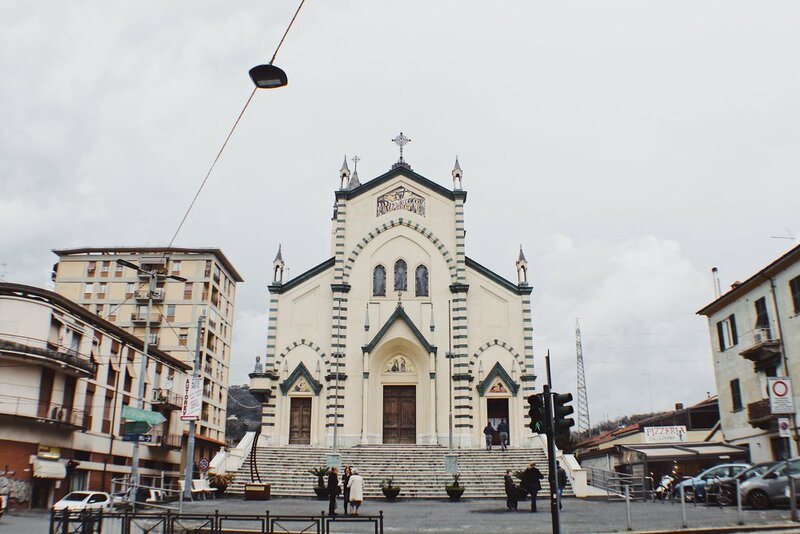 Accommodations were in fact, a lot cheaper in La Spezia, and a Cinque Terre Card, which covered the cost of admissions on to its hiking trails also covered use of the train from the city into the park. We showed up at our Airbnb on a dark and rainy night. It also happened to be the night before Easter. We almost found ourselves stuck without dinner, since the lighter for our oven was out of fluid. I left to try and see if I could find any small shops that carried matches, but didn’t need to make it much further than the house right next to us. The sweetest Italian nonna offered us a matchbox to use freely and set the tone for a great week. There’s nothing quite like straightforward kindness to set the right mood for a trip. 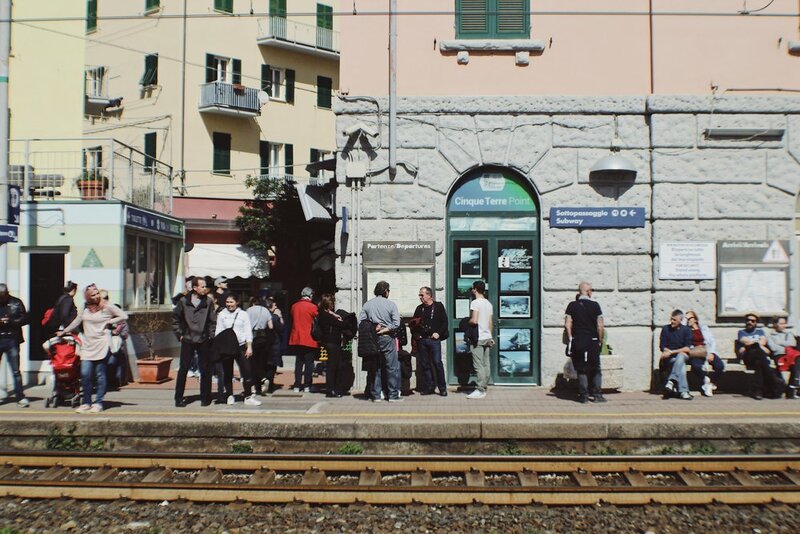 We hopped on the train at La Spezia Centrale, and I immediately realized nobody had ever said anything to me before about the crowds that visit Cinque Terre. We were there in the offseason, but it still managed to be as crowded as a stereotypical Tokyo subway car. Heck, I’ve been in Tokyo subway cars that weren’t this packed. Perhaps that’s actually a good thing, I thought to myself. If people don’t remember these crowds enough to mention them to me, maybe it’s because they’re overshadowed by something way more memorable in the park. We took the train all the way to the furthest spot within the park- Monterosso. The first thing I noticed getting off the train were some pretty costly pizza stands and gelaterias, an intensely blue coast, and swarms of people headed towards the coast or the center of town. I admired the classic look of the town center but still wanted to get away from the crowds. Deanna and I decided to hit the hiking trails immediately after finishing our order of fried calamari. This first trail was said to be the longest one, and perhaps the most challenging one. It would take about two-and-a-half hours and feature several steep climbs. I don’t know if I’d consider it a difficult hike, but it was more rigorous than you’d expect from a trail connecting two luxurious, romantic towns like Vernazza and Monterosso. Along the way, we passed by a couple people nursing ankle sprains and twists from some uneven, steep steps. The hike itself was long, but there were plenty of interesting things along the way. Troll bridges, small waterfalls, and homeless cat shelters kept us entertained. When we got to the end of trail, the view of Vernazza was incredible. As soon as we arrived, we treated ourselves to some gelato. I found a scoop of basil flavored gelato at the interestingly-titled Stalin Gelateria, and Deanna got some stratiacella. We went out to the central piazza to enjoy. Vernazza turned out to be the most crowded of the cities we’d gone to, so after finishing off our gelato we felt motivated enough to hit the next trail. At this rate, I figured we were on pace to hike through all five villages within our five days. By comparison, this second hike was a lot shorter. It only took us about an hour to get from Vernazza to Corniglia, and walking with the sun slowly starting to set made for some incredible views by the water. The part of the trail that stood out the most, though? The bar halfway in between. 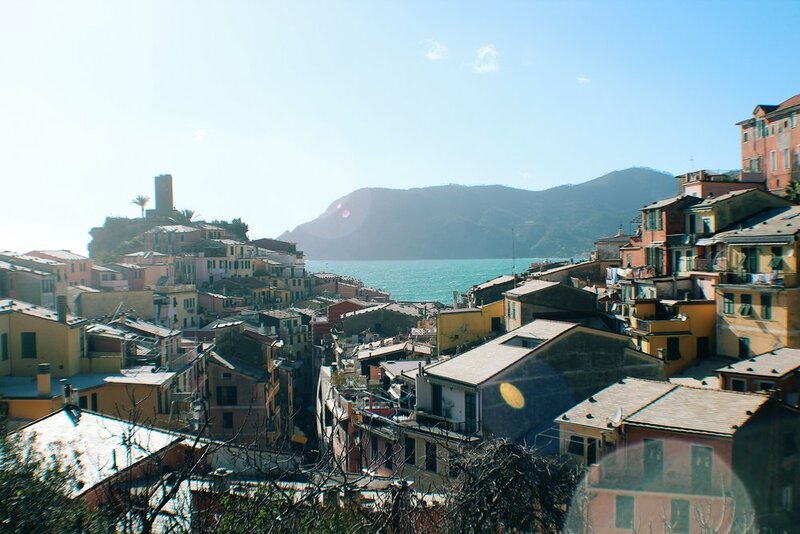 It didn’t take very long to decide that Corniglia was our favorite of the Cinque Terre. There were a number of reasons why, but it was mostly a feeling that we both got as soon as we entered that made us confident we liked this one the most. The train station is actually a little bit away from the town center, and you can either take a long flight of stairs or a bus to get there. This partly makes it feel far less crowded. The alleyways are also designed in a way that makes the whole town feel far more relaxed. We wound up getting a dinner of gnocchi and lasagne before calling it a day. We started day two in Riomaggiore, the town closest to La Spezia. We hoped to hike the two remaining trails we needed to complete the route, but we thought we would start on the opposite end. The thing I remember most about Riomaggiore was that it felt like the food court of Cinque Terre. There seemed to be twice as many restaurants- pizzerias in particular- as there were anywhere else in the park. Deanna and I wound up splitting a large Margherita pizza between the two of us and eating it in the town’s center piazza. To get back on the trails, we’d be starting with the famous Lover’s Lane, that connected Riomaggiore to the last town we had to see. Manarola. Sadly, Lover’s Lane was closed! Mudslides had made the trail too unstable. Same with the trail between Manarola and Corniglia. There went our chances of hiking between all five towns. I didn’t feel as bad about missing our opportunity to complete the trails when I learned that this one had been closed since 2011. It’s not like I just missed the boat. Instead, we took the train over to Manarola, where we spent the afternoon. Manarola might be my runner up to Corniglia in terms of favorites, thanks in part to a very large rock. The part of Manarola that sits right on the coast has a perfect series of steps leading out to a few very large rocks where you’ll find a few sunbathers and swimmers. We decided to take our time after we found a spot to lay out on, read, and relax for a little bit. A really big part of me wanted to strip down and jump into the water, but the currents were way too strong that this wouldn’t have been a good idea. It was now Tuesday, rather than Easter Sunday. The sun disappeared again, bringing the temperature down a few notches and painting the sky a threatening gray. As a result, all villages saw far fewer visitors, giving each of them quite a different feel. Monterosso in particular seemed like a different place without its crowds. This time around, we got to enjoy more of the waterfront, at least for a little bit until it got too cold. Then we made our way up, following a series of stairs to a Cappuccin convent and a large statue of St. Francis of Assisi with a dog. I don’t think it’s very likely I’ll ever be venerated. There are a few things in between me and canonized sainthood, but if I do, I wouldn’t mind having a dog with me in some statues. Just behind the convent was a cemetery, and it was a surreal reminder that as much as Cinque Terre was one of the world’s deserving tourist destinations, it’s also a place that generations have called home long before it was a national park. 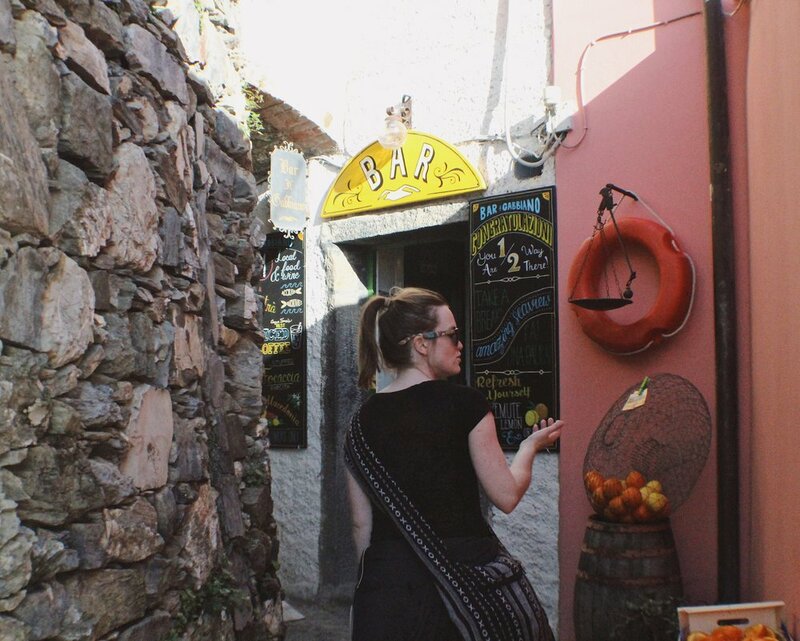 Our return to Monterosso led to more subtle but intimate-feeling discoveries like that. I’m learning how to appreciate a return trip a little bit more. A younger version of myself as would have been so motivated to add new places to my travel resume, but I’m starting to see that return trips introduce you to some of the less obvious, more intimate charms that a place has to offer. And they give you a chance to get to things you missed out the first time around. I certainly wouldn’t resist a return trip to Cinque Terre.